HomeBlogUncategorizedWhich Car Parts Most Frequently Need Replacement? Which Car Parts Most Frequently Need Replacement? If Your Fail to Replace Important Parts, You Can Find Yourself in Need of Major Car Repair. Regardless of the regularity of maintenance, every car will eventually need replacement parts to keep running. Once you’ve reached six digits on your odometer, you will likely have already had many rounds of filter replacement, along with new brake pads and any other number of issues. The performance of regular maintenance and attention to your car part needs can greatly extend your vehicle’s life and value. You are also much less likely to wind up stranded with a broken-down vehicle, or stuck in your driveway on a workday. Every car will need replacement parts as the years go by and wear accumulates. The most frequently replaced parts are listed below. As a responsible driver, you should not only familiarize yourself with these parts, but the time frames that indicate a need for replacement. Oil Filter: Of course, no car part gets replaced more often than an oil filter. A clogged filter can cause major damage, so make sure to have yours switched out every time you go in for an oil change. Air Filter: An old air filter will eventually make your air conditioning stink. Have yours changed every 40,000 miles or so. Brake Pads: Normally speaking, a driver will need to replace their brake pads every four to six years. Batteries: Regardless of how much you drive, you will need to replace your battery every four to six years. Head Lights: Five to seven years represents the lifespan for headlights. Get yours changed before they burn out, and save yourself the hassle of a ticket. Of course, once you’ve owned your car for several years, the likelihood for more significant replacement needs will appear. These will vary with the model and make of vehicle, the driver’s habits, and the whims of fate. Regardless, you should also try to educate yourself on the symptoms of more extensive repair needs. 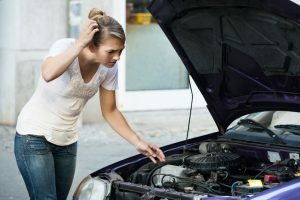 For example, if you have frequent electrical issues, dim lights, or engine stalls, you may need alternator replacement. At Express Auto Repair & Emissions, one of our specialties with car repair in Schaumburg, IL is brake services and replacement. If you hear the telltale grinding noise of worn-out brakes, give us a call at 847-895-9131. Posted in Uncategorized on October 10, 2018 by Express Auto.